Hyperopia, or farsightedness, is a refractive error, which means the eye does not bend or refract light properly. It is an eye focusing disorder, not an eye disease. Hyperopia occurs when the eye is shorter than normal or has a cornea, or clear front window of the eye, that is too flat. As a result, light rays focus beyond the retina instead of on it. Generally, this allows you to see distant objects somewhat clearly but near objects will appear more blurred. 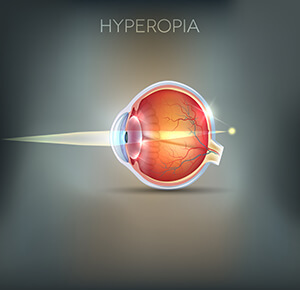 People experience hyperopia differently. Some people may not notice any problems with their vision, especially when they are young. For people with significant hyperopia, vision can be blurry for objects at any distance, near or far. Like myopia or nearsightedness, farsightedness is usually inherited. Most children are farsighted, yet they do not experience blurry vision. With focusing (accommodation), children’s eyes are able to bend the light rays and place them directly on the retina. As long as the farsightedness is not too severe, hyperopic children will have a clear vision for seeing objects at a distance and up close. As the eye grows and becomes longer, hyperopia lessens. When a person experiences blurred vision with hyperopia, it is generally treated with glasses or contact lenses, but it may also be treated surgically in patients who are good candidates.